Federal authorities are investigating an arson at a mosque in Escondido. ESCONDIDO–Local and federal authorities are offering a $10,000 reward for information leading to the arrest and prosecution of the individual responsible for the arson and vandalism of an Escondido mosque. The Bureau of Alcohol, Tobacco, Firearms and Explosives, the Federal Bureau of Investigation and the Escondido Police Department held a news conference Thursday afternoon at Escondido police headquarters to announce the reward. 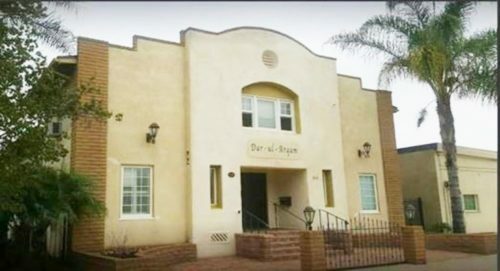 On March 24 at about 3:15 a.m., an individual set fire and vandalized the Dar-ul-Arqam Mosque, also known as Islamic Center of Escondido, located on West 6th Avenue in Escondido. Several people were inside at the time of the fire, but no one was injured. An ATF Certified Fire investigator worked in partnership with the San Diego Sheriff’s Department’s Bomb/Arson Unit to process the fire scene. The exterior of the building sustained damage and the property was found to be defaced. The cause of the fire was classified as incendiary in nature (arson) by ATF investigators. The investigation of the incident is on-going. Anyone with information about the arson at the Dar-ul-Arqam Mosque should call the FBI 24-hour tip line at 1-800-CALL-FBI (1-800-225-5324).